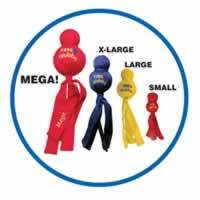 Dog toys are very important for your dog or puppy. As well as allowing them to have fun, dog toys also keep them mentally stimulated while they are at home or out on walks. Stuffed Kongs are a fantastic boredom buster for your dog. 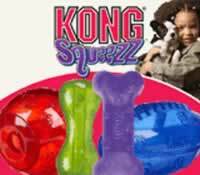 The time spent on a Kong is less time spent on your furniture and/or personal belongings! Having to work at getting the food or dog treats out of the Kong is highly stimulating for your dog and as such is rewarding your dogs’ efforts. You can get the classic Red Kong, the Puppy Kong for those young teeth, or for the powerful chewer the Extreme Kong. When walking your dog, whether on or off lead, interaction is extremely important. This is where balls, Frisbees, even Kong's come in very useful. Playing with your dog whilst out and off lead gives them reason to stay with you rather than being distracted by anything else that may be going on around you. Throwing a ball and recalling your dog helps to strengthen their ‘Recall’ and build that all-important bond with you. 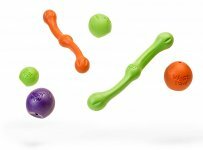 Interactive toys such as the Nina Ottosson range are great for pushing your dogs mental ability and to show you just how intelligent they are. These toys are designed to be used with your involvement, as it is you that will encourage your dog to seek out the tasty treat that you have hidden. Again, the time you spend with your dog in this manner will help to challenge their minds and strengthen your relationship.